“I was well aware of the pay cut I was taking coming into teaching after leaving engineering,” she says. “I knew there was a chance that I wouldn’t stay in Auckland. Going on strike for more money, as primary teachers plan to do next Wednesday for the first time in 24 years, won’t be easy for teachers like Deacon. That’s not why she’s in the job. She got into engineering because she loved maths and physics, but was “not feeling fulfilled” in it. “I was talking to a colleague and I said, ‘Imagine if every job got paid the same, or there was a universal basic income, then teaching should be one of the top jobs because of all the great aspects of working as a teacher’,” she says. Deacon earns $51,508 a year ($990 a week) because she has a master’s degree, slightly above the usual starting salary of just under $50,000. She is still paying off a $78,000 student loan (now down to $36,000), so her take-home pay is only $708 a week. The current median rent in Balmoral is $630 a week. Even for a one-bedroom flat, it’s $385. Deacon commutes from her parents’ home on the North Shore. “I haven’t been able to find a flat in this area – at least one that I can afford and that is not a health risk,” she says. The average Auckland house is now worth $1,050,000. Almost three-quarters of Auckland households (73 per cent) would have to spend more than 30 per cent of their income on the mortgage and other housing costs if they owned a house in the region, compared with 49 and 51 per cent in Wellington and Christchurch and just 9 per cent of households in the country’s cheapest district, Wairoa. “I know that, looking forward into the future, having a family or buying a house is not something that I feel that I would be financially secure to do, especially in Auckland,” Deacon says. As other teachers make the same calculations, Balmoral School principal Malcolm Milner is finding it increasingly difficult to find teachers. He lost six to Tauranga in 2015, and the last time he advertised a teacher’s job he got only nine applicants, mostly without NZ experience. “Three years ago we’d get up to 90 applicants,” he says. Balmoral School principal Malcolm Milner lost six teachers to Tauranga in 2015 because they could no longer afford to buy a house in Auckland. He didn’t take any of the nine this time, but through word of mouth he found a Kiwi teacher who was returning from France, and has filled the gap with a temporary appointment until she arrives. He backs the 16 per cent pay rise over two years being sought by the primary teachers’ union, the NZ Educational Institute (NZEI). 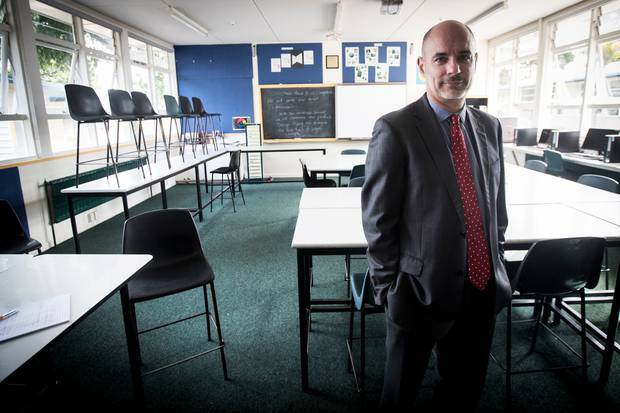 “If you had a 16 per cent pay rise, you would definitely have people wanting to apply to be teachers,” he says. The Government has just given nurses $500 million pay rises of 12.5 per cent over two years and a further 3 per cent in 2020 for nurses with at least seven years’ experience. But so far it has offered primary teachers with at least seven years’ service only 4 per cent over two years and a further 2 per cent in 2020, which would cost about $150m all-up. Ministers are torn. Labour politicians are instinctively sympathetic to raising wages, but they have also pledged to keep within tight budget limits, so every dollar they spend on teachers’ wages is a dollar less for other priorities such as housing or mental health. Only 1.9 suitable applicants applied for each secondary teacher’s job at the peak of the last economic boom in 2006, and only 1.6 suitable applicants applied for each job in the latest survey this year. But there has been a much steeper and continuing decline in students starting training in early childhood education, from 3100 in 2008 and a peak of 3630 in 2009 to just 1500 last year, reflecting the former National Government’s decision to stop paying higher subsidies to centres with 100 per cent qualified teachers. Labour has not yet restored that subsidy. The problem is particularly acute in Auckland. Principals’ Federation vice-president Cherie Taylor-Patel says a ministry official told her last term that 80 per cent of Auckland trainee teachers were leaving the city. 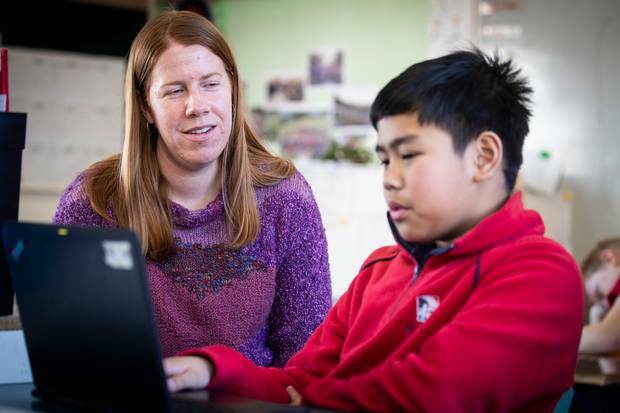 Michelle Deacon, pictured with year 7 student Pranz Cortez, chose to start teaching in Auckland, but 80 per cent of Auckland teaching graduates are said to be leaving the city. The OECD’s Programme for International Student Assessment (PISA) found that the numbers of 15-year-olds expecting to become teachers declined between 2006 and 2015, from 5.5 per cent to 4.2 per cent across the OECD and from 3.7 per cent to 3 per cent in New Zealand. Taylor-Patel says a recent survey of Auckland primary principals found the schools were short of 250 relievers a day, forcing schools to distribute a sick teacher’s pupils across other classes until the teacher recovers. “I don’t think it’s ever been as bad as it is,” she says. “It’s not portrayed as a good job,” she says. “It’s not very attractive when all you hear about is how big the workload is and the lack of resources, and with that you are having to teach 30-plus kids in the classroom. Michelle Deacon usually works 10-hour days and at least one day in the weekends. “On average I’d work a 10-hour day. I get here at 7.30am and it’s a rare day that I leave before 5pm, and most weekends I’m here at least one day,” she says. There is a lot of paperwork. As a beginning teacher, Deacon has to document everything she does so that her work can be assessed, as well as assessing her students’ work. Even experienced teachers are now expected to be “teaching as inquiry”, always trying new approaches to help students who need extra help or extension, and documenting which approaches work and which ones don’t. Some policy changes have made it harder for older students to retrain as teachers in the past few years – an important factor because in 2008 two-thirds of teacher trainees were career changers like Deacon aged 25 or over. Student loans were capped at seven years’ lifetime study in 2010, living cost loans for students aged 55-plus were axed in 2011, student allowances for postgraduate study were scrapped in 2012, and student loans for people over 40 were capped at 120 weeks (three years) in 2013. “I’m chair of the local careers expo in Taranaki, we have employers and training providers, but you will never see anyone promote teaching,” he says. However despite all these factors, the status of teaching in New Zealand remains high compared with most OECD countries: 45 per cent of NZ teachers believe “the teaching profession is valued in society”, below South Korea (67 per cent) and Finland (59 per cent) but well above the OECD average of 31 per cent. 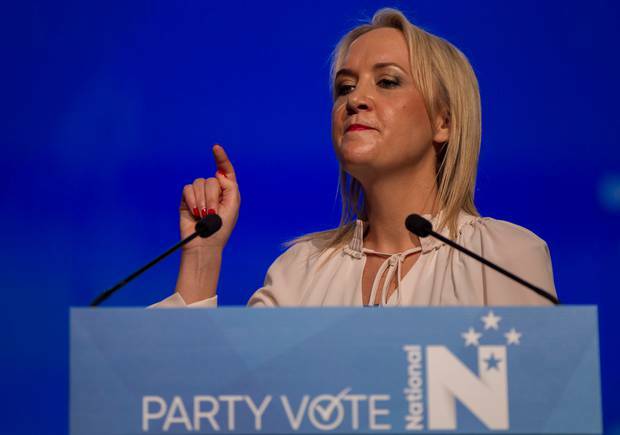 Nikki Kaye offered grants of up to $7000 to lure teachers from overseas. In the end, Labour’s Chris Hipkins extended the bonus only to decile 2 and 3 Auckland schools, extended the Teach First and Auckland beginning teacher projects, and waived fees for refresher courses in the first half of 2018 only for teachers who have not obtained full registration six years after training. 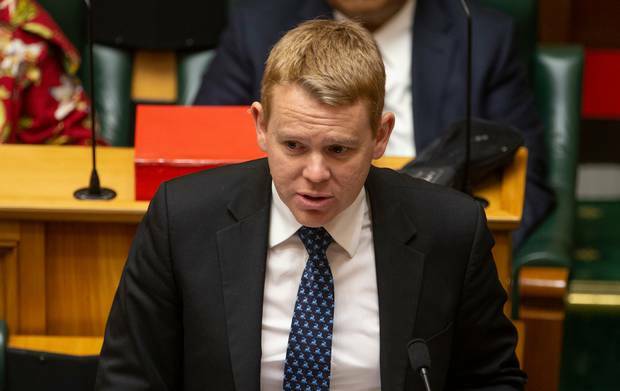 Chris Hipkins extended a bonus for beginning teachers at low-income Auckland schools to cover deciles 2 and 3 as well as decile 1. The ministry’s teacher recruitment budget was doubled from $1m to $2.4m in the financial year just ended and $2.6m in the current year, with a marketing campaign due to start next month. More significantly, Labour’s policy of scrapping fees for the first year of tertiary education this year, and three years by 2024, should make it easier for teacher trainees as well as other students. 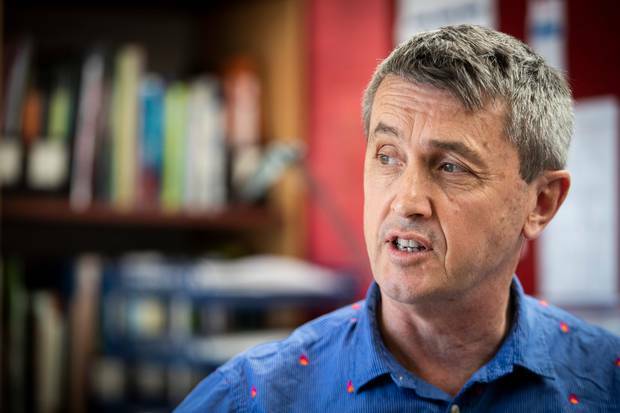 Auckland University’s deputy dean of education Wayne Smith believes we still need more incentives both to recruit people into teaching and to keep them there. Smith trained as a teacher in the 1970s when he was paid to train on a four-year studentship which increased each year until in the final year it paid two-thirds of a teacher’s starting salary. “We have to look at how we can offer some support to teachers, especially young teachers,” he says. At Balmoral, Deacon would like to see teachers’ workload eased by funding more teacher aides and reducing class sizes. She teaches in Years 4 to 8 where the ministry funds only one teacher for every 29 students, compared with 1:15 in Year 1, 1:23 in Years 2 and 3, 1:23.5 in Years 9-10 and even lower ratios in senior high schools. 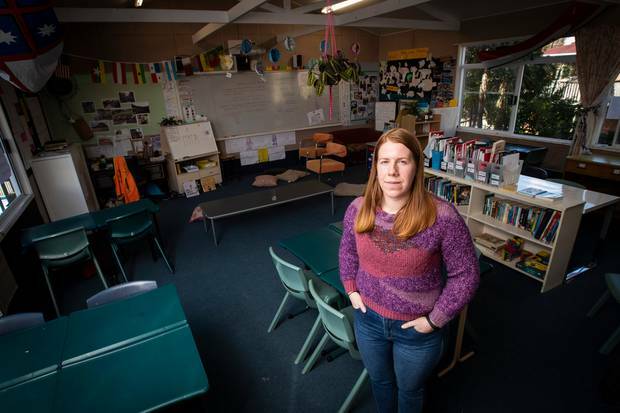 “Reducing class size would reduce [time required for] marking, planning, assessment and keeping in touch with parents, because that relationship is important too,” she says. Next week’s strike is partly about an NZEI claim for its collective agreement to reduce the Years 4 to 8 ratio to 1:25. 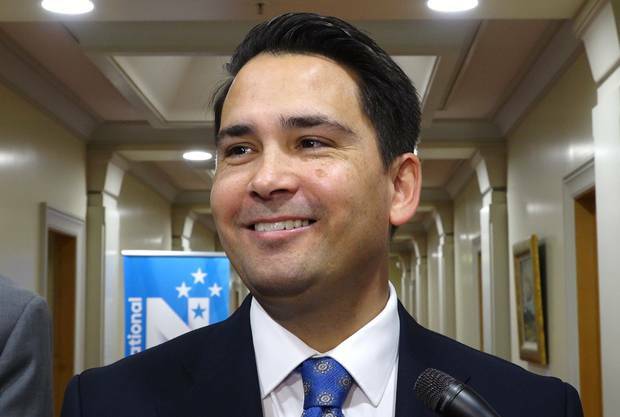 National Party leader Simon Bridges outflanked the Labour Party by pledging to cut class sizes in Years 4 to 8. The OECD found that the 15-year-olds expecting to become teachers declined most in countries where teachers’ salary increases lagged behind increased national economic output per person. “Results reveal that changes in teachers’ relative salaries are positively associated with changes in students’ expectations of a teaching career,” it says. Its data is based on only 24 countries, 12 where teachers’ salaries increased faster than output per person and 12 where teachers lagged behind. It does not provide this data for New Zealand, but the salary of a NZ teacher with seven years’ experience and no extra responsibilities rose by only 24 per cent from 2006 to last year, well behind a 46 per cent rise in our economic output per person (without allowing for higher prices in both cases). A teacher at the top of the basic scale, with seven years’ service but no extra responsibilities, earned 75 per cent more than the median wage in 1998. Today the top basic rate of $75,949 is only 52 per cent above the median. The ministry says the average primary teacher’s total pay, including allowances, has increased by 30.6 per cent since 2007 to $72,900. Glendowie College principal Richard Dykes says NZ beginner teachers start on much less than their counterparts in Australia. However this is simply because New Zealand is a poorer country. OECD figures show that NZ teachers’ earnings average 86 per cent of those of all tertiary-educated workers, about the same as 87 per cent in Australia and the OECD average of 85 per cent. Nurses’ salaries are quite similar. The pay hike agreed this week will lift the top rate for a registered nurse with seven years’ experience from $66,755 to $75,132 by next year and $77,386 by 2020. The NZEI claim of 16 per cent would lift the comparable rate for teachers with seven years’ service from $75,949 to $88,100 by next year. The Post Primary Teachers’ Association (PPTA) lodged claims this week for an immediate 15 per cent pay rise plus a housing allowance of up to $100 a week for teachers renting, or paying the first three years on a mortgage, in the high-rent cities of Auckland, Tauranga and Queenstown. PPTA president Jack Boyle says the housing allowance is targeted at younger teachers as a “recruitment lever”. PPTA president Jack Boyle sees a rental housing allowance as a “recruitment lever” to attract younger people into teaching. “I’m hoping for a KiwiBuild,” she says. 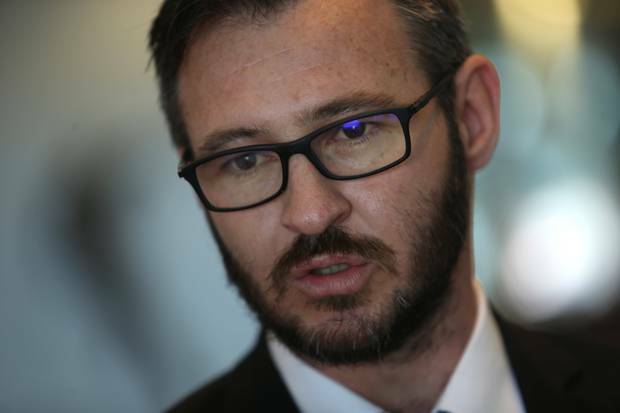 “If we said, ‘Yes, you’re right, everybody is behind the eight-ball, so let’s top you up to where you were in 2003,’ then we’ll all be paying 50c in the dollar tax,” he says. Deacon emailed the Weekend Herald after we met her to explain why she planned to be part of next week’s strike. “As a first year teacher I do feel uncomfortable about striking and asking the Government for more support when I knew what I was coming into,” she wrote. “I knew what the pay was, and I knew that during the first two years, as I worked towards full registration and learned on the job, that I would be extremely busy and often stressed. I signed up for that, I own that decision. “However, the reason I’m striking isn’t for me, it is for my students. “At this point in my life, I think that I can handle the teacher workload and teacher salary, and although I don’t think it’s a fair workload or a fair salary, I’m happy to have a job I love even if it means making sacrifices in other areas. “But when I see that so many other teachers, who love the profession as much as I do, can’t handle the workload and salary after many years in the job, I start to worry that many students won’t have teachers in the future.